LEE DENIM CARPENTER JEANS. COPPER RIVET'S WITH BIG E. FRONT RISE-13. This is an amazing pair of original Lee overalls! 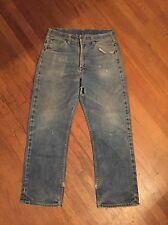 Rare Lee riders 101 Indigo Hige Whiskers Denim jeans. Sanforized Union Made in USA. Length 29. Condition is very good. Hard to find in this condition & size. Few snags. 1 hole at crotch. Check pics ! Waist Size 33. Union Made in USA. Talon Zipper. Lee rivets. Leather Lee patch. Top button is back stamped #20. Beautiful pair of 1970s LEE Rider Prest bootcut pants. These pants feature a burgundy color with a striped herringbone twill fabric, Talon 42 zipper, classic 5 pocket design, perma prest pant leg with bootcut opening. Waist: 33". High waist with straight leg. Inseam: 29". Style : Riders. (See photos). This is How We Rate Our Jeans. Inseam: 29". "Good" - Item shows noticeable wear but still has structural integrity. Waist: 19". Front Rise: 13". Made in USA. Front rise : 12". Leg opening : 9". Out seam length : 38". Color : Faded Indigo Blue. Material : 100 % Cotton. There is a small frayed spot just under the fly that needs to be fixed. 11" flare, 100% soft cotton denim, talon 42 zipper, union made! space pockets! Condition: Fair, holes, belt loop needs tacked down, fading, tears,distressed, stains. Leather Patch. Brass zipper and button. Side seam waist to hem: 40. Rise: 13 1/2. Inseam: 29.